Nights in the bush in Zimbabwe are never quiet. There is always a cricket chirruping somewhere and in the summer after the first rains the noise grows substantially. Right now there is a cricket somewhere in my kitchen. I don’t mind, in fact I rather enjoy the company! Some years ago family friends who’d emigrated to the UK smuggled a cricket back to their house in Oxford because they missed the sound so much. It lived for some months at the base of a pot plant and performed dutifully every evening. It’s not just the crickets of course that advertise themselves at the beginning of the rains. All manner of bugs (really beetles) teem around the lights at night, crunch underfoot, land in the milk and eat the rose bushes. On a good night they can really shred a large rose bush. That I DO mind! Later in the rains the another set of insects arrives; the mantids. 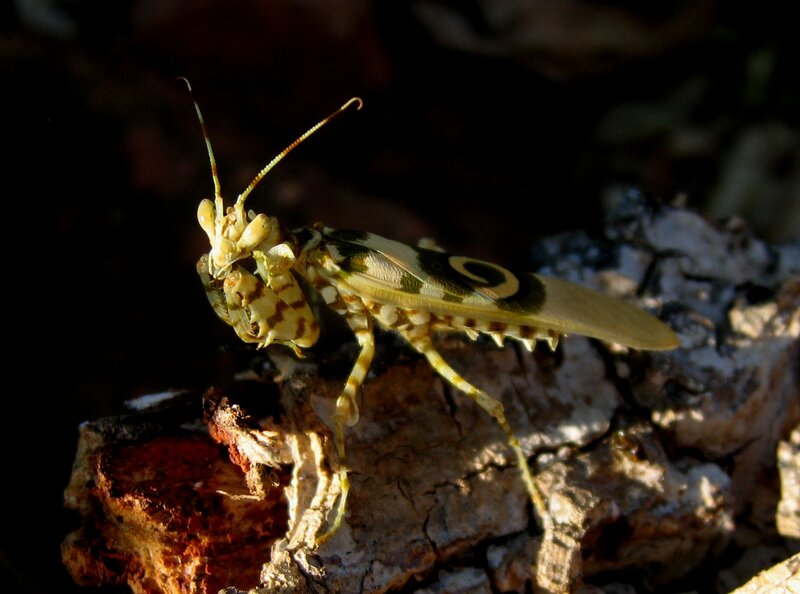 Some are truly extraordinary in their beauty and I had one nymph living for about 6 weeks in a rose bush outside my bedroom. 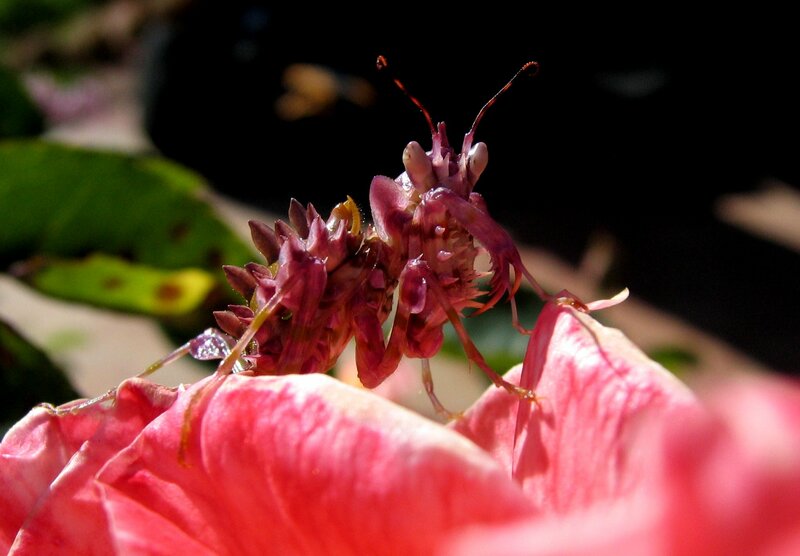 It only lives in flowers that match its pink colouration and ambushes insects that come the the flower. I used to feed this one the occasional bee until one day it disappeared, probably eaten by a passing bird. It really did not deserve to pass on its genes as the roses had come to an end and it did not have the sense to move on. Still, I did miss it. The rose beetles as is their common name, are small (about 5mm long) and roundish and a light brown. They get into a few unexpected places too and can give a respectable nip. Beware those who like to sleep au naturel! A few days ago I woke up and needing some asthma medication shook my inhaler, and, as per instructions took a deep breath while pressing the cartridge down. And inhaled a rose beetle. Fortunately it just bounced off the back of my throat and was duly spat out but it could have been a deal more unpleasant. 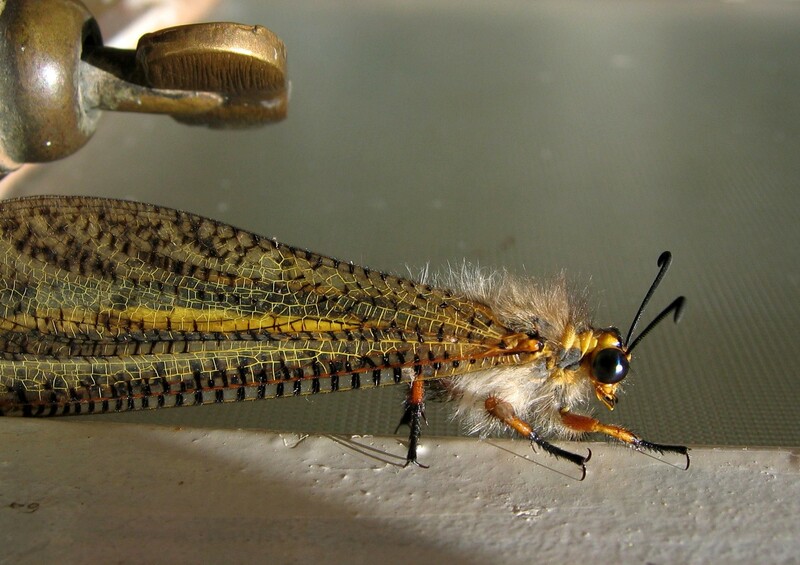 This is a picture of an antlion adult that I took earlier this year. It is Palpares sobrinus; isn’t she a beauty? The photo should be vertical but it fits better on the screen this way. It spent the entire day on my bathroom window patiently being photographed. My camera is a Canon Ixus 500 (5 M pixel pocket type) and it has an extraordinary macro facility for such a small camera. Yes, I did use a Unilock tripod that has independently moving legs that allow one to put the camera just about anywhere. Now I’m just waiting to see what this rainy season brings!